BEST TIME TO VISIT: Anytime COMMENTS: Rice is located in south-eastern San Bernardino county, on state route 62, west of Earp, CA. There are no current residents in Rice. Rice, California. From my memories starting in the mid 1950's As a kid, (I'm 73 now) I remember that Rice, Ca. had a small community of people living there in the 1950's, I believe most were Miners, ex railroad or people still living there from when Rice was a big place during WW2. The above plack has some history about how Rice served during WW2. For more information about Rice, go visit the General Patton Memorial Museum at Chiriaco Summit, California. http://generalpattonmuseum.com/ It's located about 30 miles East of Indio, California on the I10 Freeway & about 20 miles West of Desert Center, California. There was an airfield built during the WW2 occupation of Rice. See below. At the very top of this photo (North) is Hiway 62. About 30-50 feet North of the Hiway is the California-Arizona RR. See https://www.gwrr.com/railroads/north_america/arizona_california_railroad#m_tab-one-panel For more information about the railroad. About 100 feet North of the RR is the MWD California Aqueduct. It was built in 1939 & the water comes from Parker Dam/Lake Havasu. The water that passes Rice has been through 2 huge pumping stations (Intake & Jean) & it will go through 3 more (Eagle mountain, Iron Mountain & Hayfield) before it gets to the end of the Aqueduct at La Verne Ca. West of Indio, the Aqueduct is underground. This Google Earth photo shows just how big & important Rice was during WW2. This airport maintenance area is just South of Hiway 62 & about ½ mile East of the town site of Rice. At the top, right area of this photo, shows some of the command headquarters, Barracks & other war time facilities. I remember reading somewhere that Rice reportedly had 6000 people in this lonely & desolate place then. 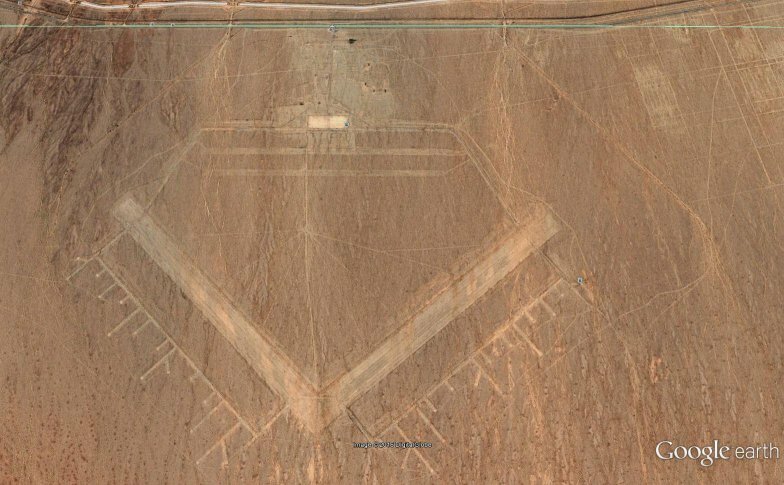 The scars made on the dessert floor by man & his machines take a LONG time to heal, but it does help to give today's generation an idea of how populated Rise once was. Getting back to my story, as my family drove through Rice at night which most people did in the hot months, I could see a few very dim lights, most likely from oil lamps or candles in the railroad cars parked on a siding. I knew that some poor families were living inside the Caboose & the 2 old wooden box cars that had windows added in them, as when in the cooler months, we would be going through Rice in the day time & I could see small children playing outside. Behind those RR cars were the usual wooden RR buildings & water tank & a very tall Black metal oil tank. Across Hiway 62 on the South side of Rice's "Main street" was a big wooden building that was built on the East side of the RR spur that went Southeast to the Blythe area. That store, which probably sold almost anything a person living there needed was the main attraction in Rice in those days. About 300 feet East, was Rice's most beautiful building, the 1 room Rice school house. Actually, it had 2 rooms, in back was a smaller room for the school teacher. In those days, it had a chain link fence around it, because sometime earlier, the school had been closed & the people there wanted to preserve it. But, time is cruel to such places! in 1959, When I was a teenager & had my own car, as I drove through Rice 1 night, I was surprised to see that the big store had burn down & all that was left was a cement slab! That was the death of Rice for about a decade, as within a few months, the old RR cars no longer had any lights in in them at night. In the early 70's, as I was approaching Rice one night, I could see many very bright lights. Someone had bought a used Standard gas station & had reassembled it about 150 feet West of where the old store had been. Not only was there a complete, nice looking gas station, but a 2 stall Automotive service building, a Restaurant, a mobile home behind for the owners & a few other buildings, including a generator building to supply electricity to all of these new facilities. A very nice idea, that must have cost someone a bundle, but now the public's need for such facilities in the middle of nowhere was not as needed as in earlier times. Times had changed, Cars & their tires were now were far more reliable, So, most people could now drive from LA to the Arizona border without stopping, so this place was constantly struggling to stay alive. Sometime in the early 80's if I remember correctly, the rice gas station was closed & soon abandoned. Right after that, someone broke into the Rice school. About 5 years after that, I must assume some drunks decided to burn the school, probably just to watch it burn. Below, this 2005 photo Looking East (East bound Hiway 62 is just out of view, left) shows where the once beautiful Rice school WAS. 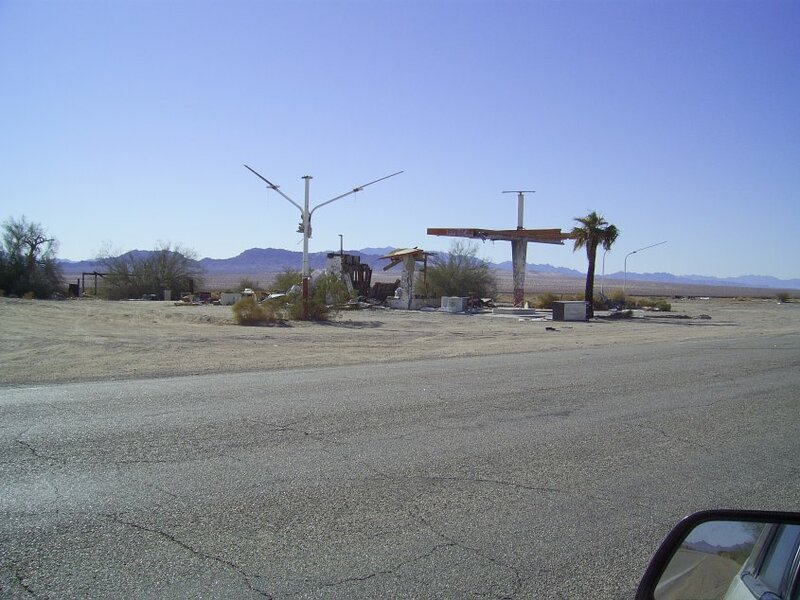 For a while, someone used to have a For Sale sign on the tin gas station service building, as it was new in the 70's. It was just behind where the palm tree is today. It's now gone. The only thing left today is the canopy for the gas pumps. (2005 photo looking Southwest) Today, Rice is a sad looking place. Once, such a dynamic place, the only sounds you hear now is the sound of the afternoon wind going through the scrub brush that struggle to stay alive. Jerry Whiting Perris, California. 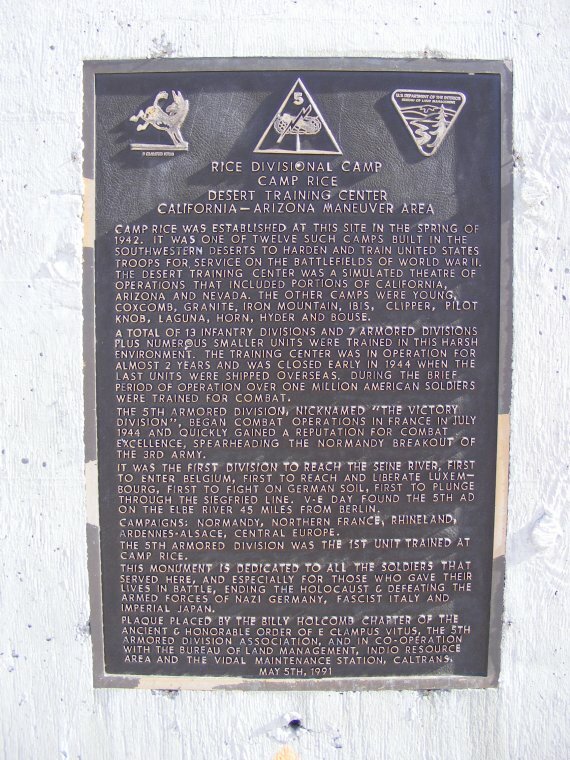 Rice was part of the Desert Training Camps during WW2 as well as a water stop for steam trains. The ruins of old 76 gas station was open as late as the late 1970's. The world famous Shoe Tree is here also. It is about 30min west of Vidal Junction on CA-62. "Circa 1936, in the town of Rice, California, my Dad ran a "two pump" Shell filling station. Groceries and supplies were by a six or eight hour round trip into San Bernardino, by Duesenberg at 90mph. My Mother, attempting to keep busy in a town of maybe fifteen people, decided to paint a wooden chair. She did an outstanding job . . . the once rough and contoured seat was now smooth white enamel . . . and in a day or so with night-time temperatures often above 100 degrees, the paint quickly dried. A friend, Bill (or Ed) Horton, came out from Riverside, the following Sunday, still dressed in his suit from church. They visited there in the little house . . . the "bigger" of the two houses, that is. When it came time for him to leave, he rose from the chair, taking with him a new coat of white paint on the seat of his good suit. (Although I was present, I hadn't yet been born.)" "Rice, California . . . one of three contenders for the first nuclear test. It lost . . . but a look in "Google Earth" reveals that a nuclear test would not have done a more thorough job of making the town almost disappear. I have a collection of old photos . . . memories of the stories told by my parents . . . and the copper emblem from the car: An eagle, with spread wings, "Duesenberg, Straight 8", sitting with other keepsakes . . . I looked at it this morning." 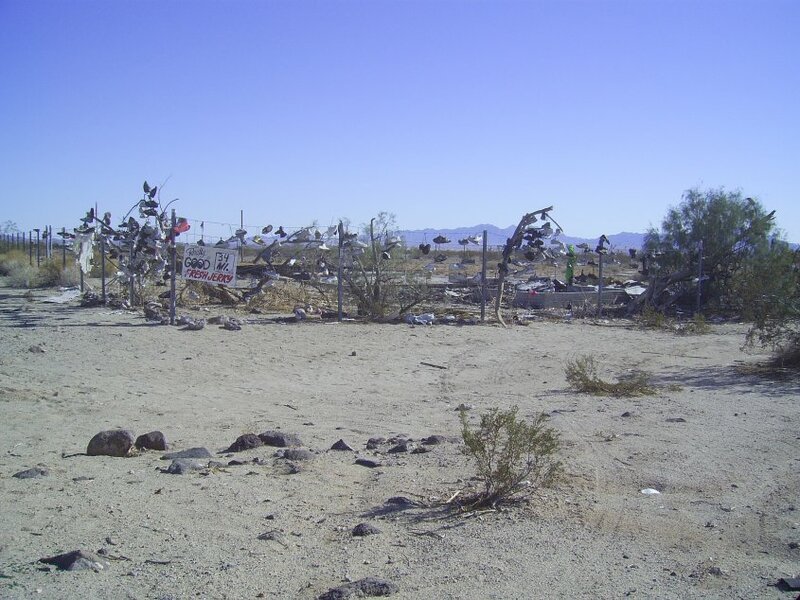 'Thought you might like to know that once, "real people" once lived in this desolate spot in the middle of "no-where", in the middle of the California desert . . . and Rice is far more important than might be assumed.